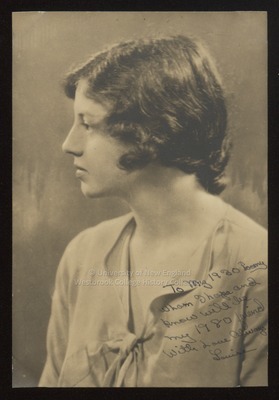 A formal sepia toned portrait of Louise Learner [Learned], 1930 Westbrook Seminary and Junior College student, is labeled "Louise Learner my roomate." Louise wrote on her own portrait: "To my 1930 Roomey Whom I hope and know will be my 1980 friend. With Love Always. Louise"